Café Naïveté: Finally - the Bulgari retrospective! Finally - the Bulgari retrospective! So finally, after three months of planning I managed to see the Bulgari exhibition with my own eyes. I did a careful research about it and posted here about two months ago (click!). And guys.... that is definitelly something worth seeing in your life, twice if you can! Too bad that the exhibition is finishing on the 13th of September, that is on Sunday. The Palazzo degli Esposizioni was perfect for this exhibition as, thanks to it's different articulated rooms (on the piano nobile), the division of the Bulgari creations in eight different monumental galleries gave a perfect picture of the Maison's evolution through time. 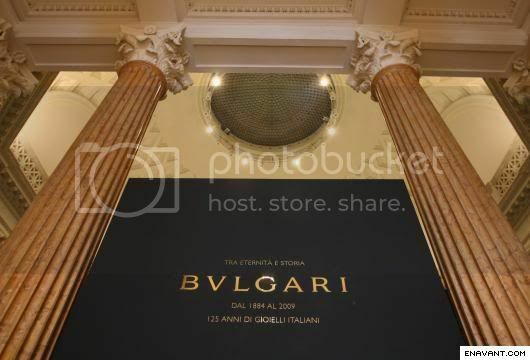 And, like a cherry on top of the cake, the visitor's final destination is in the central rotonda, where the Bulgari's finest, most precious and exclusive creations of the new millenium are exposed. It's almost impossible to find pictures of the exhibition itself (deep inside I hoped that maybe taking pictures was alloud so I brought my camera with me.. but "hey-are-you-joking-or-something!?" was written on the face of the gallery's keeper, when I asked so.. no pics from me.) But here are some I found (after a loooooong search). I should name the photographer to: Filippo Monteforte, a roman photojournalist who makes part of the Italian national news and photo agency "ANSA". 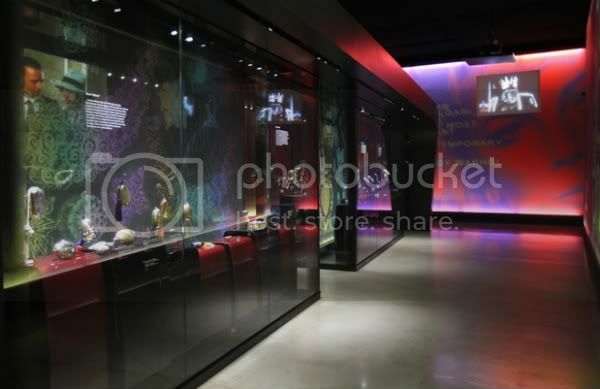 I liked the interiors a lot, quite cleverly invented- black walls and lightening based on purple-red-orange colour nuances made the whole thing so dark, secretive and magical, something that well goes with the jewellery world. 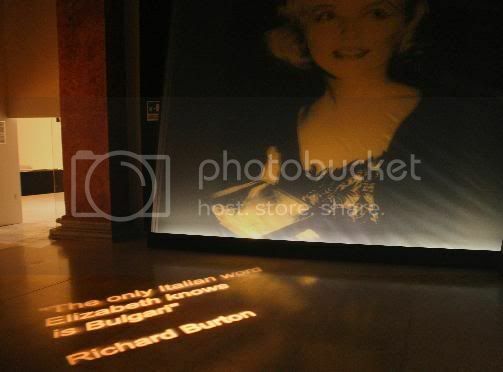 The quotations said by famous people like Richard Burton, Elizabeth Taylor and other weren't traditionally written just on the walls but also on the floor and different surprising places. That was original. The nicest one was by Andy Warhol - he announced that visiting Bulgari shop in Rome was like a trip to a contemporary art museum (in the 70's). 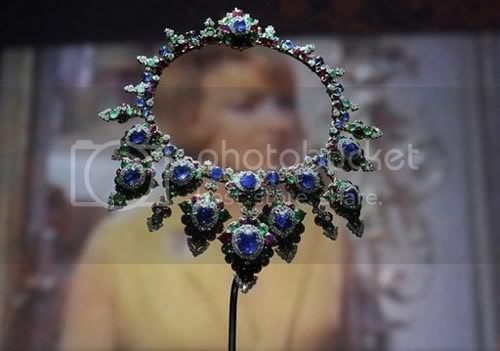 Infact the jewellery from that period was much inspired to Pop Art and hippy-flowery-powery-movement. 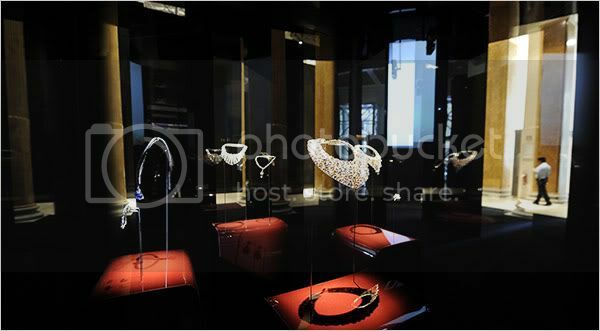 I personally appreciated the first creations (twenties and thirthies) of the jewellery house the most, by Sotirio Bulgari himself. And ofcourse, remarkable were the serpentini-watches, the one that Liz wore on Cleopatra set for example was... undescribable!! !